3. Which router is the root of an SPF tree? Refer to the network shown in the diagram. Which command sequence on RouterB will redistribute a Gateway of Last Resort to the other routers in OSPF area 0? 7. Why is it difficult for routing loops to occur in networks that use link-state routing? RouterA, RouterB, and RouterC in the diagram are running OSPF on their Ethernet interfaces. Loopback interfaces (Lo 0) are configured as shown. What happens when RouterD is added to the network? Which command sequence will enable OSPF in the backbone area for the two Ethernet links on RouterA? Link-state protocols require careful network design. Link-state protocols are prone to routing loops. Link-state hello updates can cause broadcast flooding. Link-state protocols place significant demands on router processors and memory resources. Link-state protocols require a knowledgeable network administrator. Link-state protocols do not support Variable Length Subnet Masking. 13. What speeds up convergence in a network using link-state routing? 14. Because of security concerns, a network administrator wants to set up authentication between two routers. Which of the following commands will configure Router_A to trust Router_B with a clear text password of apollo? It is set to 1544 by default for all OSPF interfaces. It can be set with the ip ospf cost command. The configured loopback addresses map to link costs. It is calculated proportionally to observed throughput capacity of the router. It may be calculated using the formula 108/bandwidth. 16. A network administrator has configured a default route on Router_A but it is not being shared with adjacent Router_B and the other routers in the OSPF area. 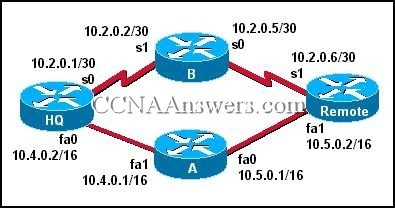 Which command will save the administrator the time and trouble of configuring this default route on Router_B and all of the other routers in the OSPF area? 18. 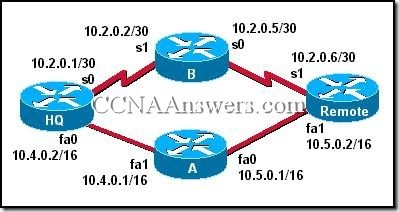 Which router command will display the interface priority value and other key information for the OSPF configuration of the serial 0 interface?